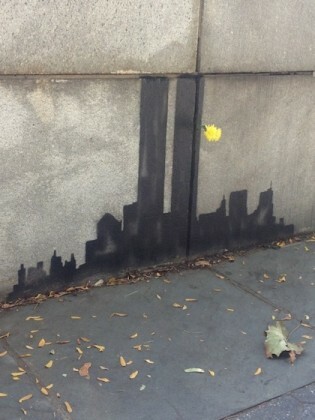 While most of Brooklyn Heights is littered with graffiti from no talent taggers, the city was quick today to remove the Twin Towers tribute at the Fruit Street Sitting Area created by world famous street artist Banksy earlier this week. It had quickly become a beloved part of the neighborhood with many rushing to take photos of it while pausing to remember those who perished on 9/11/01. However, the Parks Department has a different point of view. After all, we can’t have world famous artists defacing our neighborhood, right? That right is reserved for no talent punks as evidenced by the countless number of meaningless tags in and around Brooklyn Heights. So with no consideration of this being a new, notable addition to our landmarked district, the Parks Department destroyed real art. Heckuva job fellas! The NY Post has created a time lapse image of the destruction.